How do I integrate Zoom with my Canvas Site? To give students access to Zoom, link Zoom to your Canvas course site. Integration of Zoom with Canvas gives students direct access to your meeting room without having to register. Additionally, students will be able to easily access Zoom via the course menu in your Canvas site. For instructions, visit our “Integrate Zoom with Canvas” documentation. If you have a relatively new computer then your computer’s automatic audio and video settings will work fine. It is always best to be in a quiet space when live on Zoom, as background noise can be very distracting. If you are concerned about background noise or have trouble hearing your students, then we suggest using headphones with a built-in microphone. By default, your video may be off when you start a meeting. Click ‘Start Video’ to show yourself. Select “Manage Participants” located in your in-meeting zoom menu bar (toggle mouse to view) . The “Host” of the meeting will have control over all functions and features in the meeting. 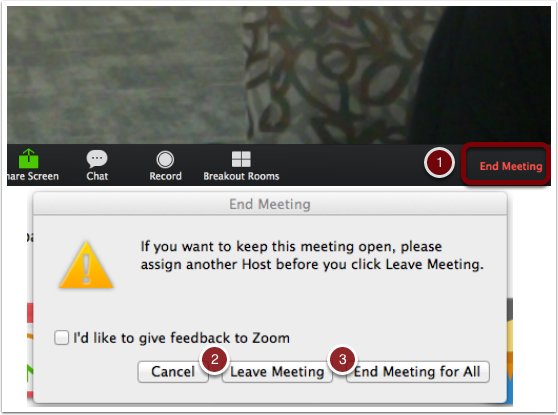 Host controls allow you as the host to control various aspects of the Zoom Meeting. The main panel contains several functionalities related to the meeting. 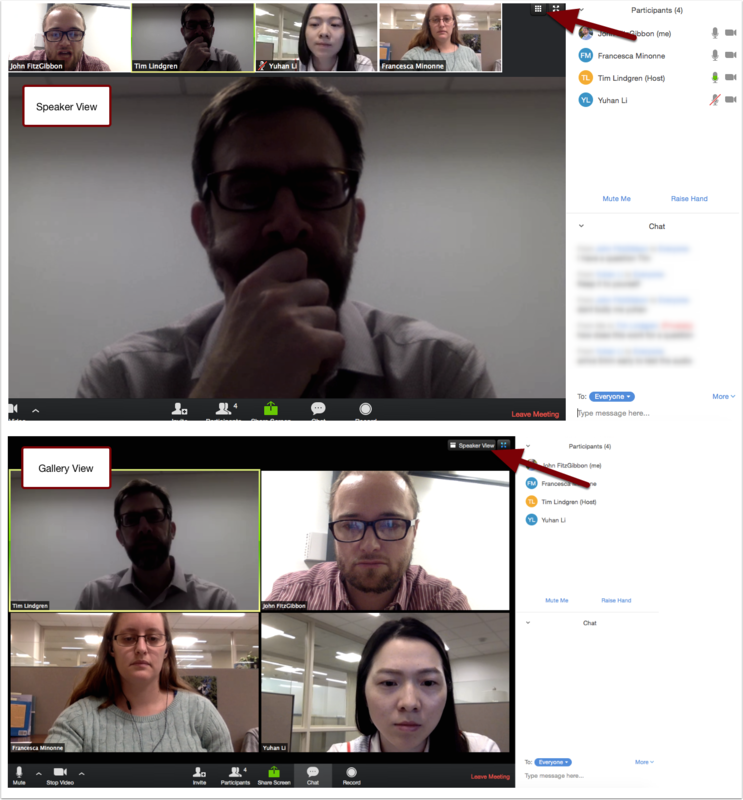 Once in the Zoom meeting, there are a range of controls that can be used. Select the microphone icon in the left corner of the window to mute and unmute yourself. To stop the video, select the video icon. You can select “invite” to invite others via email. As host of the meeting, you will have additional controls under “Manage Participants” (see previous step for more information). You can also start recording by selecting the “record” button. 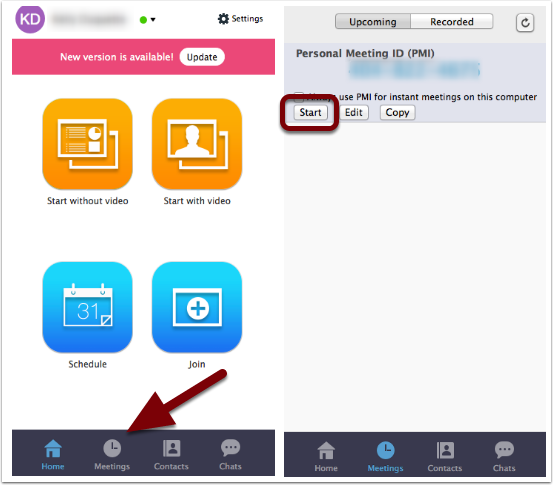 The “breakout rooms” icon allows you to split your Zoom meeting into separate sessions (see Zoom Advanced Guide for more information). Finally, to end the meeting, select “end meeting” in the lower right corner of the window. 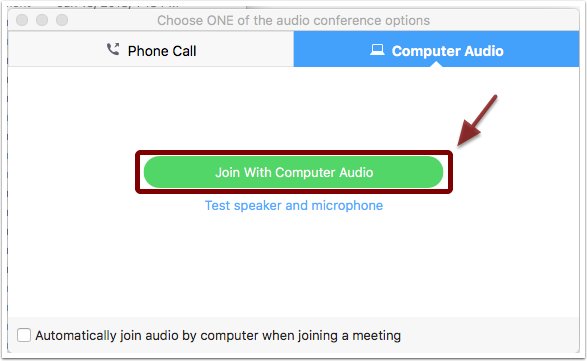 By default, your meeting will begin in “Speaker View.” Speaker view displays whoever is speaking in the main window [image 1]. You can also view your video layout in “Gallery View.” To switch to gallery view, select the icon in the upper-right corner of your screen. When viewing in gallery view, you will be able to see all participants (up to 25) in the same window [image 2]. To switch back to speaker view, click the icon in the upper right corner. Click “End Meeting”. The “End Meeting and Leave Meeting” Screen appears. Click “Leave Meeting” if you want to leave a meeting you joined . Select “End Meeting for All” to end a meeting for which you are the host . Click “cancel” if you decide you do not want to end or leave the meeting.